Designing a curb with transit vehicles in mind can allow vehicles to pull close to the platform and to “dock,” reducing the gap between the vehicle and the platform, and helping to facilitate level or near-level boarding. 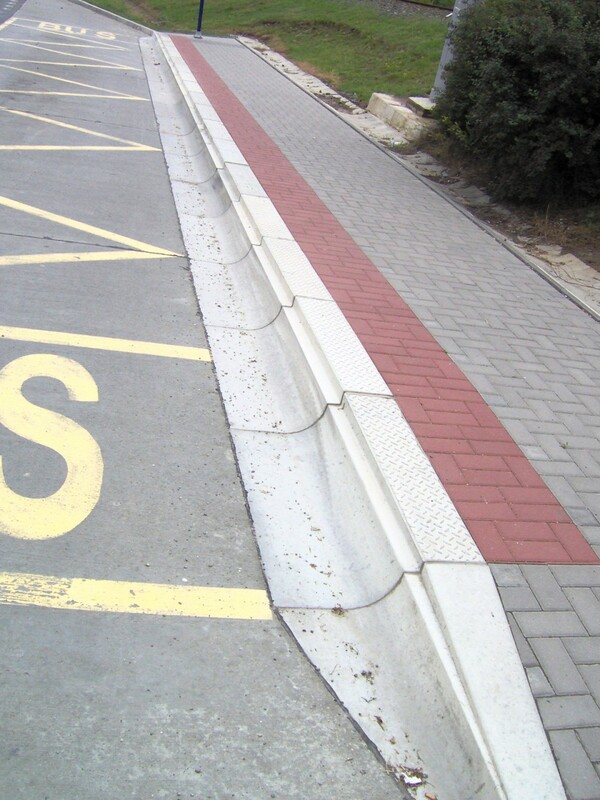 Types of transit curbs applicable to streets include concave-shaped concrete, as well as standard rectangular-section curbs with hard rubber, plastic or other polymer bumpers. 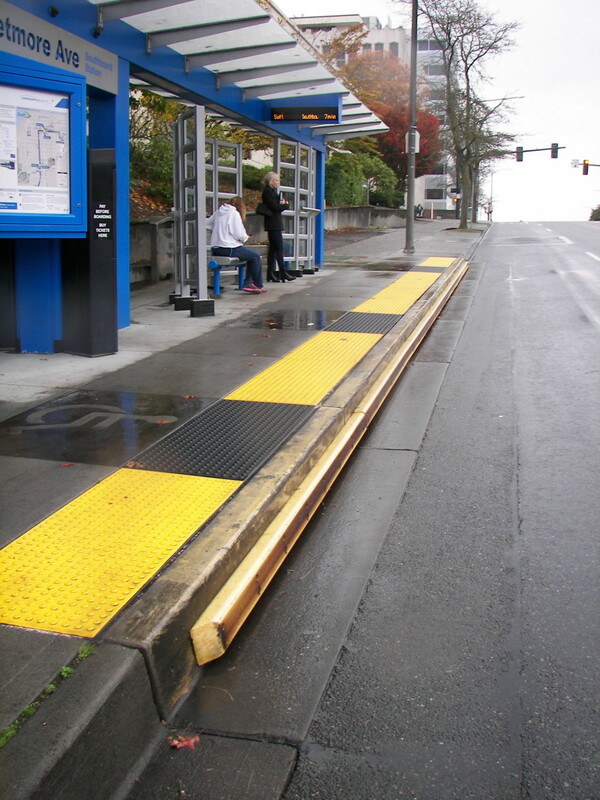 At locations with level or near-level platforms with low-floor vehicles, transit curbs should be considered. 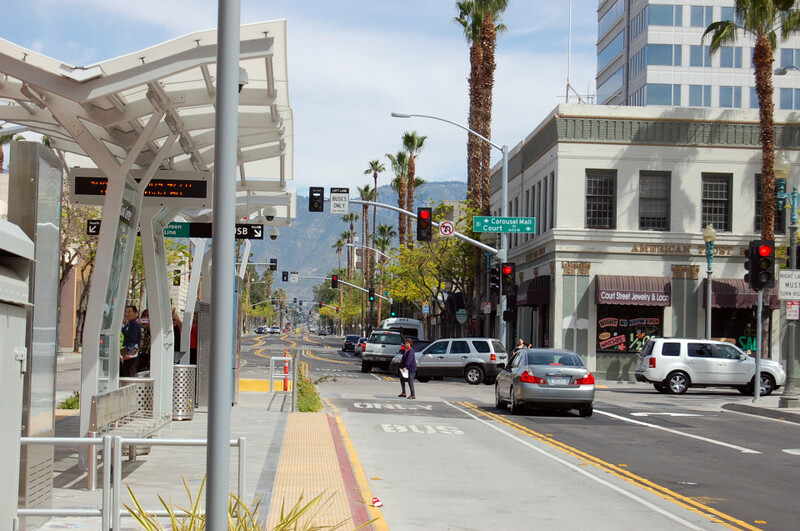 Transit curbs allow drivers to pull the bus within 2 inches of the curb without scraping the vehicle wheels or lugnuts. For curbs to be effective, vehicles must enter the stop straight-on, making in-lane stops best suited for transit curbs. Pull-out stops must provide sufficient straightening distance. 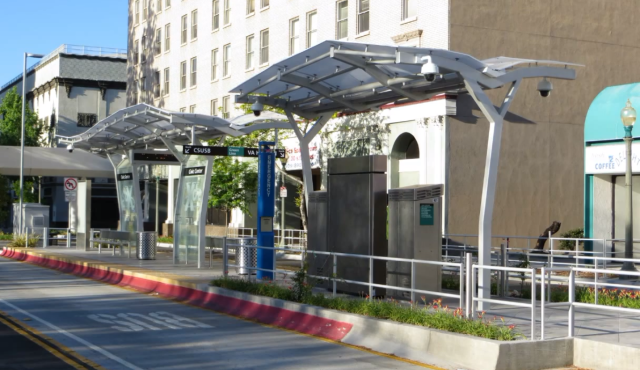 The curb can be designed with a slope or concave shape—the curb’s shape positions the bus as the driver pulls in, allowing the bus to stop within 2 inches of the platform. 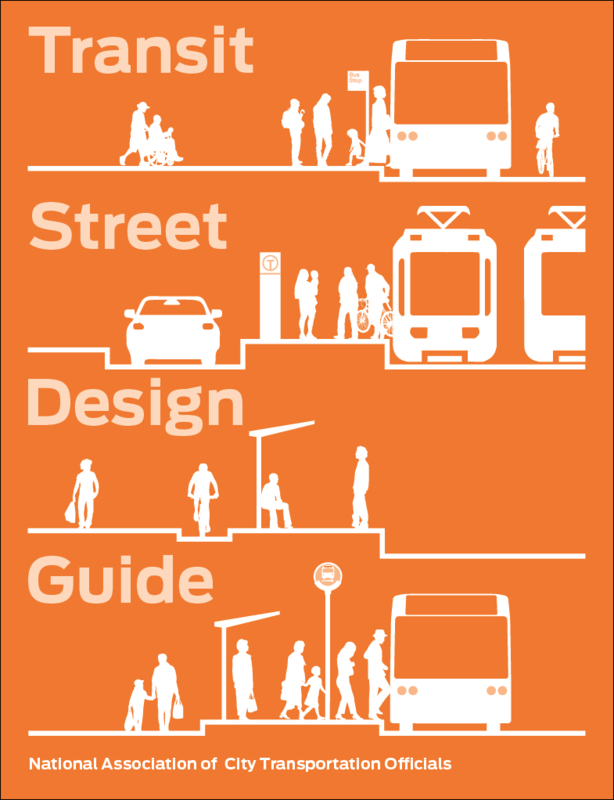 Variations similar to the Kassel Curb and Dresden Combibord can be applied with streetcars or trams. A small recess at the platform level allows the rail vehicle to hang over the curb and reduce the gap between platform and vehicle floor. Pedestrians may not expect the shape or height of the curb. Use pavers, paint, or railings to alert and guide pedestrian footfalls. High-contrast color or materials also support visibility. Use only where buses have little lateral movement entering the stop, and the boarding area extends the entire length of the bus. Kassel curbs may encumber additional risk of overpulling onto the curb where the the bus makes a signficant “pull in” movement. Accessible bus stop design guidance. Bus Priority Team technical advice note BP1/06, Transport for London, UK (2006). Curb height must be greater than 6 inches. Taper curb at platform entry and exit. Typical Kassel curbs taper down and away from the centerline roughly 3–4%. Kassel Kerb Data Sheet, Brett Landscaping and Building Products. Install detectable warning strips to warn pedestrians of curb location, especially on flat surfaces where platform height is greater than 6 inches.